You and a colleague are doing a Powerpoint presentation over Highfive about your company's snack budget. 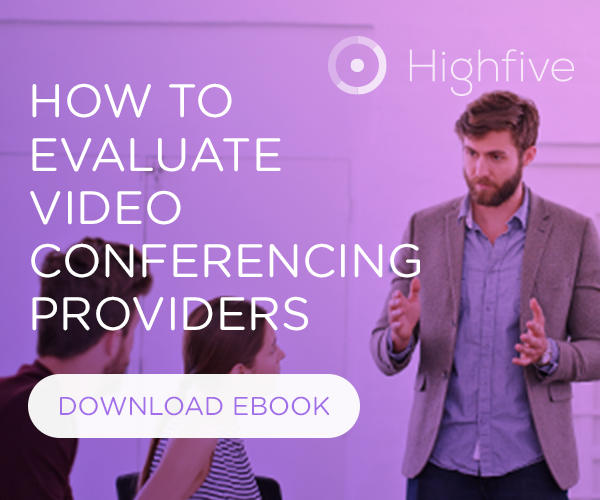 Both of you are in a conference room using the Highfive system and your CFO has joined the meeting remotely. Question: How do you leave the meeting so that you can take your laptop with you, but not disconnect your CFO and colleague? Answer: Use the Keep Meeting Running on TV feature! First, ensure that you're paired to the Highfive device and that there is at least one other remote participant in the call. If your TV is the only participant in a meeting, any session on your TV will automatically end when you leave. The Highfive device will not remain in an "empty call" by itself. And that's it! You have left the call and are now free to take your laptop wherever you please. How do others stop the call? After all other participants leave, the Highfive-equipped TV will notice it's the only participant left and will automatically disconnect after a few seconds. Alternatively, if your conference room is equipped with a Dolby audio device, you can tap the Leave meeting button on it's touch-screen display to end the call in the conference room.